In today’s post I will show how to get a free US DID - a local number and point it to your VoIP network. For this setup I will use an analog phone plugged into a FXS port of a Cisco 1751-V router. The use of a voice router isn’t necessary, you may also use an ATA - Analog Telephone Adapter. Go to http://www.ipkall.com/ , sign up and you will receive your DID by email. After receiving the email you should login and change the SIP Phone Number to whatever number you’d like to send to your SIP server. 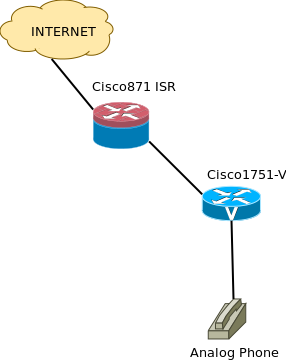 Also the SIP Proxy must match your server’s IP address used for receiving the calls, in my case this will be the Cisco 1751 voice gateway. Forward the signaling and media ports to the voice gateway: I am using NAT for my home network so I will have to set the 871 router to forward all the packets coming on the SIP signaling port UDP 5060 and also the RTP media ports - which is the UDP range between 8000 and 32000 to the voice gateway.